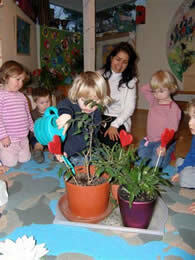 Our Neohumanist Kindergarten in Oslo has existed since 1991. Through all these years our kindergarten has been doing a lot of service providing spiritual knowledge to the Norwegian society. Many children have been blessed with the feeling of infinite love they experience through the daily kiirtan with the “Baba Nam Kevalam” mantra. Daily simple and short meditation is used daily to teach children inner peace and self discipline. We teach children to identify and get in contact with the great power they carry within. We are very conscious about what we eat. There is only sentient food in the kindergarten. Everyone is a vegetarian: children, teachers and some of the parents. In addition we eat food of ecological quality. We teach vegetarian cooking classes to the children, teachers, parents and the local community. We are known and accepted in the area as the vegetarian school. Our children are very active in doing service to nature. We pick up garbage off the streets; we recycle glass, metal and paper. We support different environmental organisations and we do service to plants, animals and nature around us. Every child has a plant which they learn to love and take care of every day. Our academic and creative pedagogical aspect is presented through themes based on our brahma chakra circle of creation. We present each theme through songs, dance, music, theatre, and practical activities. Our children learn ethical values which guide them to understand and experience the meaning of love. First they learn to love their creator; the divine energy or universal love within them; then everything and everyone around them. They learn to be kind to themselves, and then be kind to others. They learn to share; to be honest, to think rationally and express their feelings, both good and bad. They learn to love everyone and everything around them; living and non-living. They learn that everything has an existential value. 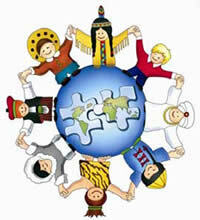 Our kindergarten supports several projects in the third world, and also the AM organisation in several different ways. It supports the work and expenses of several workers around the world. Our kindergarten is known to the local area, the local authorities, and the minister of education of Norway. We are known through different magazines, TV programs and personal contact, and our kindergarten is becoming more and more popular because of the essence behind its Neohumanist education system – “LOVE” ! !